From Publishers Weekly: Sports agent Steinberg has represented some of the biggest, best-paid names in professional football -- Drew Bledsoe, Troy Aikmen, Steve Young -- and has pushed the salaries of these athletes ever upward. Refreshingly, he attributes such successes at least partially to his ethical and conscientious business philosophy. Writing with journalist and author D'Orso, Steinberg conceives of this sportsmanlike guide through the fundamentals of negotiating as "a book about life." In order to negotiate effectively, he insists that one begin "with an understanding of yourself -- a brutally honest assessment that is not always easy to attain" and admonishes readers to "ask yourself what is going to make you happy before you pursue [your goal]." 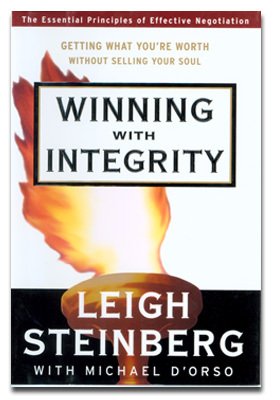 As a coach prepares his team for a big game, Steinberg sets up the playing field with clearly defined chapters (Orientation, Preparation, Positioning, The Encounter, Making the Deal), gearing them toward anyone trying to make a deal -- be it landing a job, getting a promotion, even buying a car or house. Some of the techniques may not fly with your average boss or job interviewer (Steinberg suggests responding to an irate negotiator by saying, "Do you think I hear you any more clearly when you raise your voice? "), but his moral philosophy, "that it is always more advantageous to act ethically, to take the high road," is what makes his book a useful guide.